The Korean Won is up 32% since March, and 8.2% on the year. At the same time, it is 20% below is 2007 year-end level, as well as 13% weaker than the 2006 average of 955 and 15.5% weaker than the 2007 average. Focusing only on the Won’s appreciation would probably cause some technical analysts to back off, while comparing it only to the highs of a couple years ago would lead others to pile in, without knowing examining other indicators. In my opinion, this is a situation in which technical analysis – because of the potential to send conflicting signals – falls short. Ergo, let’s turn to the fundamental picture. The Korea Won has adhered closely to the overarching forex narrative. When the credit crisis struck, investors fled from Korea, and the Won lost 50% of its value practically overnight. With the return of risk-taking in the second quarter of 2009, however, the safe-haven appeal of the Dollar faded, and the Won rebounded strongly. With the potential end of the carry trade in sight, however, the Won has stuttered, and some analysts portend a decline in the near-term. However, while many currencies will no doubt experience a correction if/when the Fed raises interest rates, the Korean Won probably won’t be one of them. Korean investments have certainly been buoyant of late, but not nearly to the same extent as in other emerging markets, where it could be argued speculative bubbles are now forming. In addition, Korean interest rates are hardly lofty; its benchmark rate is only 2%, hardly enough to justify a carry trade strategy in and of itself. Instead, investors have been flocking to Korea for the economic fundamentals. 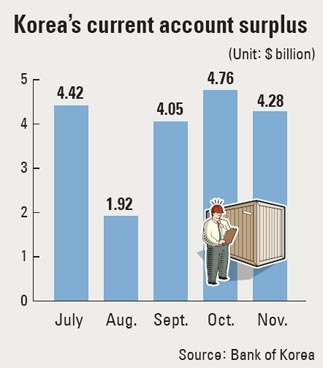 Despite an appreciating currency, Korea’s trade surplus is on pace to hit a record $45 Billion this year, with a healthy $15-20 Billion forecast for 2010. In fact, the rising Won has has virtually no effect on exports, as Korean companies had prudently assumed that the Korean Won would be even more expensive (based on 2007 levels). In the automobile industry, for example, “New models being introduced now were designed and engineered two years ago to keep the company in the black even if the won strengthened to 900 to the dollar.” For that reason, analysts expect 2010 will be a banner year for the economy. After a modest expansion in 2009, GDP is projected to grow by 4.5-5% next year, the third highest among large economies, behind only China and India. The Central Bank of Korea is also operating as though the Won will keep appreciating, irrespective of what happens to the carry trade. In one session last week, it intervened in forex markets to the tune of $500 million, with the goal of depressing the Won. With the recent expiration of a currency swap with the Fed, this is just as well, as Dollars could soon once again be in short supply. Korean monetary policy remains expansionary, but if the economy takes off in 2010 as expected, the Central Bank will have no choice but to raise rates and keep inflation within its target range. In addition, there is now talk of turning the Korean Won into an international currency. ” ‘Korea has the opportunity to upgrade the won’s global status as a host country of the G20 2010 Summit.’ International use of the Korean won has been insignificant, although the nation’s share in international trade and finance has increased quickly,” analysts have observed. That the government of Korea is looking to promote the Won as a stable currency implies that it is comfortable with the prospect of further appreciation. In short, the Won will probably be one of the standouts in 2010. Many currencies will suffer as changes in global monetary policy and the appearance of asset price bubbles cause investors to back off of the carry trade and exit certain emerging markets. South Korea won’t be one of them. With strong fundamentals and a growing profile, it’s no wonder that most analysts expect the Won to appreciate by another 10% in 2010. Given that tomorrow is the first day of 2010, we won’t have to wait long to find out! On that note, happy new year! In October, the Reserve Bank of Australia (RBA) became the first industrialized Central Bank to raise interest rates. It followed this up with two additional hikes in November and December, bringing its benchmark rate to the current level of 3.75%, by far the highest among major currencies. This series of rate hikes caught (forex) markets completely off guard, and investors moved quickly to price the changes into securities and exchange rates. The Australian Dollar initially spiked more than 7% following the first rate hike, bringing its total appreciation in 2009 to 32%- enough to earn it the distinction as the second-best performing currency, after the Brazilian Real. 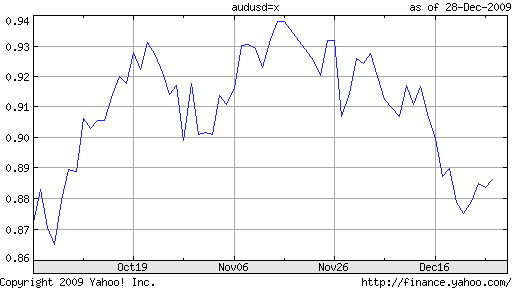 Beginning in November, however, concerns began to build that perhaps traders had gotten ahead of themselves, and the AUD has been in freefall since then. Investors now fear that the RBA may have acted too hastily in hiking rates so soon and so fast. By its own admission, the RBA raised rates only after much deliberation: “The rate adjustment ‘would not be intended to slow demand compared with the current forecast path, but aimed simply at keeping the stance of policy appropriate for improving economic conditions,’ ” according to its own minutes. Since the recession was ultimately so mild (some would say ‘non-existent’) in Australia, however, the RBA ultimately decided that (pre-emptive) rate hikes were in order. Now, interest rates are back in the “normal range,” according to a deputy governor from the RBA. In other words, the current rate is perceived as neither promoting nor hindering aggregate demand, which means it may not need to be tweaked much more in the near-term. In addition, there is growing concern that further rate hikes could trigger a cycle of deleveraging, because of the high debt burdens that plague Australian households and businesses. Household debt already exceeds 100% of GDP, which is even higher than in the US. Besides, financial institutions are raising their own lending rates by wider margins than the benchmark rate hikes, so there is less impetus for the RBA to act further. Investors appear to have come to terms with this, as futures markets now reflect a 45% probability of another interest rate hike at the next RBA meeting, in February. This is down from 67% only last week. If you’re wondering whether the RBA could be influenced by the lofty Australian Dollar when conducting monetary policy, it’s conceivable but not probable. It has already acknowledged that the carry trade is generally “back in vogue” and specifically targeting its very own Aussie, but that “As on earlier occasions, the economy has proven to be resilient to these [forex] swings.” If it turns out that the markets truly overestimated the pace of recovery (and by extension, interest rate hikes) in Australia, then the RBA won’t even have to worry about whether the economy can withstand further appreciation, since the AUD would probably remain fixed at current levels. Today, we bring you an interview (the second part, and complete transcript) with Edward Hugh, a macro economist, who specializes in growth and productivity theory, demographic processes and their impact on macro performance, and the underlying dynamics of migration flows. Edward is based in Barcelona, and is currently engaged in research into the impact of aging, longevity, fertility and migration on economic growth. He is a regular contributor to a number of economics blogs, including India Economy Blog, A Fistful of Euros, Global Economy Matters and Demography Matters. Forex Blog: I’d like to begin by asking if there is any significance to the title of your blog (“Fistful of Euros”), or rather, is it only intended to be playful? Obviously the title is a reference to the Segio Leone film, but you could read other connotations into it if you want. I would say the idea was basically playful with a serious intent. Personally I agree with Ben Bernanke that the Euro is a “great experiment”, and you could see the blog, and the debates which surround it as one tiny part of that experiment. As they say in Spanish, the future’s not ours to see, que sera, sera. Certainly that “fistful of euros” has now been put firmly on the table, and as we are about to discuss, the consequences are far from clear. Forex Blog: You wrote a recent post outlining the US Dollar carry trade, and how you believe that the Dollar’s decline is cyclical/temporary rather than structural/permanent. Can you elaborate on this idea? Do you think it’s possible that the fervor with which investors have sold off the Dollar suggests that it could be a little of both? Well, first of all, there is more than one thing happening here, so I would definitely agree from the outset, there are both cyclical and structural elements in play. Structurally, the architecture of Bretton Woods II is creaking round the edges, and in the longer run we are looking at a relative decline in the dollar, but as Keynes reminded us, in the long run we are all dead, while as I noted in the Afoe post, news of the early demise of the dollar is surely vastly overstated. Put another way, while Bretton Woods II has surely seen its best days, till we have some idea what can replace it it is hard to see a major structural adjustment in the dollar. Europe’s economies are not strong enough for the Euro to simply step into the hole left by the dollar, the Chinese, as we know, are reluctant to see the dollar slide too far due to the losses they would take on dollar denominated instruments, while the Russians seem to constantly talk the USD down, while at the same time borrowing in that very same currency – so read this as you will. Personally, I cannot envisage a long term and durable alternative to the current set-up that doesn’t involve the Rupee and the Real, but these currencies are surely not ready for this kind of role at this point. So we will stagger on. On the cyclical side, what I am arguing is that for the time being the US has stepped in where Japan used to be, as one side of your carry pair of choice, since base money has been pumped up massively while there is little demand from consumers for further indebtedness, so the broader monetary aggregates haven’t risen in tandem, leaving large pools of liquidity which can simply leak out of the back door. That is, it may well be one of the perverse consequences of the Fed monetary easing policy that it finances consumption elsewhere – in Norway, or Australia, or South Africa, or Brazil, or India – but not directly inside the US. 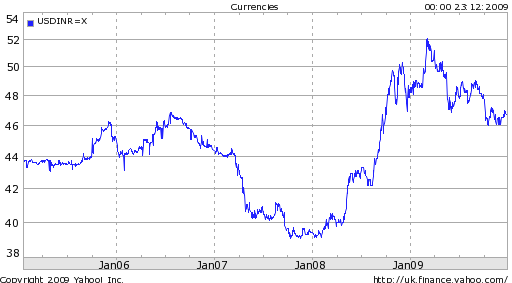 This is something we saw happening during the last Japanese experiment in quantitative easing (from 2002 – 2006) and that it has the consequence, as it did for the Yen from 2005 to 2007, that the USD will have a trading parity which it would be hard to understand if this were not the case. I am also suggesting that this situation will unwind as and when the Federal Reserve start to seriously talk about withdrawing the emergency measures (both in terms of interest rates and the various forms of quantitative easing), but that this unwinding is unlikely to be extraordinarily violent, since the Japanese Yen can simply step in to plug the gap, as I am sure the Bank of Japan will not be able to raise interest rates anytime soon given the depth of the deflation problem they have. Indeed, investors will once more be able to borrow in Yen to invest in USD instruments, to the benefit of Japanese exports and the detriment of the US current account deficit, which is why I think we are in a finely balanced situation, with clear limits to movements in one direction or another. Forex Blog: In the same post, you suggested that the Fed will be the first to raise interest rates. Why do you believe this is the case? How will this affect the Dollar carry trade? Well, I would want to qualify this a little, becuase things are not that simple. In fact, as Claus Vistesen argues in this post, the ECB has rather “locked itself in” communicationally, and by talking up the eurozone economies they now have markets expecting clear exit road maps and even pricing in interest rate rises from the third quarter of next year. But if we look at the underlying weaknesses in some of the Eurozone economies – evidently Spain, but Italy is hardly likely to have a strong robust recovery, and the German economy needs exports and hence customers to really return to growth – it is hard to see monetary tightening being applied with any kind of vigour at the ECB, so they may move up somewhat – say to 2% – and then stop for some time. I was also suggesting that in the short run they may do this to assist in the process of unwinding the global imbalances, since allowing the Fed to lead the world out of the monetary easing cycle would almost certainly provoke a rebound in USD, and problems for correcting the US current account deficit. Really none of the developed economies (not even Norway) seem to be looking at the sort of really strong “V” shaped rebound some investors were anticipating, and it is more a question of who is weaker among of the weak. But if we look a little further ahead, at potential growth and inflation dynamics, then it is clear that the deflationary headwinds are stronger in Europe, while headline GDP growth may well turn out to be stronger in the US, and both these factors suggest that the Fed will at sometime be tightening faster than the ECB, in a repetition of what we saw from 2002 to 2005. Forex Blog: You have pointed out that fiscal problems are not unique to the US. While the UK and Japan are certainly in the same fiscal boat, there seem to be plenty of examples of economies that aren’t, or at least not to the same extent, such as the EU. Do you think, then, that the long-term prospects for the Euro (especially as a global reserve currency) are necessarily brighter than for the Dollar? Well, actually I wouldn’t say the UK and Japan are in the same fiscal boat. Let me explain. The UK evidently has severe short term problems (as does the US) with its sovereign debt, due to the high cost of resolving the lossses produced by the current crisis. But Japan has still not resolved debt problems which were produced in the crisis of the late 1990s, and indeed both gross and net debt to GDP simply continue to rise there. So I would say – as long as they can weather the present storm – the outlook for US, UK and French sovereign debt is rather more positive than it is for Japan. Indeed in the longer term it is hard to see how Japan can resolve its problems without some kind of sovereign default. This is the problem with deflation, as nominal GDP goes down, debt to GDP simply rises and rises. But the principal reason I am rather more positive on UK, US and French sovereign debt in the mid term is simply the underlying demographic dynamic. These countries have a lot more young people (proportionately) than the Germany’s, Japan’s and Italy’s of this world, and hence their elderly dependency ratios (which are the important thing when we come to talk about structural deficits into the future) will rise more slowly. It is also important to realise that the EU – at this point at least – is not a single country in the way the US is, and indeed there is strong resistence among European citizens to the idea that it should be. So it is impossible to talk about the EU as if it were one country. That being said, the lastest forecast from the EU Commission suggests that average sovereign debt to GDP will breach the 100% threshold across the entire EU by 2014, so I would hardly call the situation promising. Basically some cases are much worse than others. In the East there are countries like Latvia and Hungary which are currently implementing IMF-lead structural transformation programmes, ut it is far from clear that these programmes will work, and sovereign debt to GDP has been rising sharply in both cases. In the South a similar problem exists, with Greek gross sovereign debt to GDP now expected by the Commission to hit 135% by 2011, and Italian debt set to increase significantly over the 110% mark. At the same time the future of government debt in Spain and Portugal is becoming increasingly uncertain. I would also point to the strong gamble Angela Merkel is making in Germany, and indeed ECB President Jean Claude Trichet singled the German case out during the last post rate-decision-meeting press conference for special mention in this regard. The future of German sovereign debt is far from clear, and markets certainly have not taken in this underlying reality. So basically, and I think I have already explained my thinking on this in earlier questions, we have a structural difficulty, since I am sure the way out of Bretton Woods II will not be found by simply substituting the Euro for the USD. Europe is aging far more rapidly than the US, and the dependency ratio problems are consequently significantly greater. Forex Blog: Current EU economic policy seems to be favoring government spending and exports, at the expense of investment and domestic consumption. Does this imply that the current EU economic recovery is unsustainable? I don’t think the current EU expansion is unsustainable as such, but I do think it faces tremendous headwinds. Basically one Eurozone country stands out among the rest, France, since France has a sustainable, internal demand driven, recovery, despite all the longer term issues she faces with the structural fiscal deficit. But the story begins and end there, with France. Most of the rest of the Euro Area 16 have problems, although like Tolstoy’s unhappy families, each is problematic in its own special way. Countries like Germany and Finland are heavily export dependent, and thus have had far deeper recessions than many of the rest, while countries in the South, lead by Spain and Greece, have been running sizeable current account deficits. Since financial markets are now longer willing to fund these, and the ECB isn’t prepared to support the unsupportable forever, these economies too are now being steaily pushed towards dependence on exports for growth (and for paying down their debts), and this raises the issue of where the final end demand is going to come from. France on its own cannot supply the export surplus needs of the other 15, so external customers are needed, and this makes the value of the Euro more of an issue than it was. Forex Blog: It seems that the reason that the the the Fed’s liquidity injections have not resulted in price inflation is because much of the funds have been plowed back into capital markets, rather than used for consumption. Given that this liquidity must at some point be pumped out by the Fed, does this imply that a “correction” is inevitable? Yes, this is true, the global capital markets have acted as a kind of “back door” on US monetary policy, and much of the excess liquidy the Fed has been trying to pump in has simply “leaked out” via that channel. Why this should be is an interesting question in its own right, since while initially the “credit crunch” meant that funds were not available to borrow the money is now there but it is the banks who have difficulty identifying creditworthy customers given the prevailing levels of unemployment, foreclosure and bankruptcy. My feeling is that a sharp correction is not coming, unless there is a large event (Greek sovereign default, for example) in Europe or elsewhere, which leads to a sharp contraction in risk sentiment of the kind we saw after the fall of Lehman Brothers. I wouldn’t like at this point to put a figure on the probability of such an event, but the risk is evidently there. I don’t think the risk of a correction driven by a rapid withdrawal of US liquidity is that real since I don’t think we are going to see that kind of speedy withdrawal, and even if we did, “ample liquidity” is going to be on offer over at the Bank of Japan until the cows come home. I don’t think we are going to see any precipitate removal of monetary support at the Federal Reserve, since I think exiting this situation is going to be more complicated than many imagine. The tussle which has been going on between the Japanese Ministry of Finance and the Bank of Japan over many years now may well offer a much better guide to exit issues than anything in recent US history, simply because, at least since the 1930s, the US has not been here before. Essentially it will be difficult to withdraw both fiscal and monetary support at one and the same time, but my feeling is that in the US (unlike Japan) there may well be consensus that the fiscal issue is the most pressing one, and thus this would suggest the Federal Reserve will keep monetary conditions easier for longer, simply to provide an environment in which fiscal consolidation to take place. Forex Blog: Given the strong economic and fiscal fundamentals of Norway’s economy, do you think currency traders will begin to pay more attention to the Kroner? Do you think it could be taken up as a reserve currency by Central Banks that have become disenchanted with the Dollar? Well, I think they already are, and evidently the Kroner has become a favoured carry currency. But equally, I doubt the Norwegian authorities would want their country to go the same way as Iceland in the longer term, so I am not sure they would welcome central banks buying Kroner in any large quantity, since this would obviously unrealistically raise the value of the currency, and lead to serious sustainability issues in the domestic manufacturing sector. Basically, as I suggested in the previous interview, I think dollar disenchantment is now likely to be seriously tempered by concerns about Euro weakness. Forex Blog: It seems that the financial crisis has exposed some of the problems of a common economic/monetary/currency policy for the EU. What are the implications for the future of the ECB and the Euro? Most definitely. Following Dubai a lot of attention is now focused on sovereign debt, and on who exactly is responsible for what. We should take note of the fact that the Greek government had to raise 2 billion euros in debt recently via a private placement with banks, against a backdrop of credit downgrades and steadily rising spreads. The ECB undoubtedly agreed to this move given the degree of policy coordination which must now exist behind the scenes, they are, after all, the ones who are financing the Greek banks, but it does highlight just how things have moved on in recent months. Only last year it was imagined that the being a member of the Eurozone in and of itself gave protection from the kind of financing crisis Greece increasingly now faces, and this was why only eurozone non-members, like Latvia and Hungary, were sent to the IMF. Now it is clear that the ECB could keep protecting Greece from trouble for ever and ever, but they cannot simply keep financing unsustainable external deficits and continue to retain credibility. In this sense the financial crisis has now “leaked” into the Eurozone itself. And this has implications I would have thought, for countries like Estonia, who see Eurozone membership as a “save all”, whatever the price. The difficulty is that the ECB has the capacity to fund troubled countries, but it does not have the power to enforce changes. So obviously, the EU authorities badly need to plug this hole in their armour, or the entire concept of having a common monetary system can be placed at risk, Angela Merkel and Nicolas Sarkozy (who are ultimately the paymaster generals) need to have the power and authority to see to it that national parliaments do what they need to do in the common interest, and they need to get this power and authority in the coming weeks and months, and not simply in the “next few years”. And Europe’s leaders need to be aware that a crisis of sufficient proportions in any one country can very rapidly become a systemic one for the Euro, in much the same way that a problem in a key bank can lead to a crisis of confidence in a whole banking system. I do not feel a sufficient sense of urgency about this in the recent pronouncements of Europe’s leaders. Forex Blog: So from what you are saying, there is still a risk of a resurgence in the financial crisis on Europe’s periphery. Would you say another round of financial turmoil is now inevitable? Well the risk is certainly there, and evidently Europe’s institutional structure is in for a very testing time. But no war is ever lost before the battles are fought, although what we can say is that new and imaginative initiatives are certainly going to be needed. Sovereign risk has now spread from non-Eurozone countries like Latvia and Hungary, straight into the heart of the monetary union in cases like Greece and Spain. Mistakes have been made. As I argued in Let The East Into The Eurozone Now! in February 2009, the decision to let the Latvian authorities go ahead with their internal devaluation programme never made sense, and the three Baltic countries and Bulgaria should have been forced to devalue – and the accompanying writedowns swallowed whole – and then immediately admitted into the Eurozone as part of the emergency crisis measures. Perhaps some would feel that this lowering of the entry criteria would have damaged credibility, but as I am stressing here, leaving so many small loose cannon careering around on the lower decks can cause even more issues if matters get out of hand and contagion sets in. So it is a question of pragmatism, and being able to accept the “lesser evil”. Unfortunately, the situation has simply been allowed to fester, and in addition the much needed change in the EU institutional structure – to allow Angela Merkel the power she is asking for to intervene in Parliaments like the Latvian, Hungarian, Greek and Spanish ones, as and when the need arises – has not been advanced, with the result that we are increasingly in danger of putting the whole future of monetary union at risk. It is never to late to act, but time is, inexorably running out. As the old English saying goes he (or she) who dithers in such situations is irrevocably lost. Caveat emptor! the Dollar suggests that it could be a little of both? limits to movements in one direction or another. 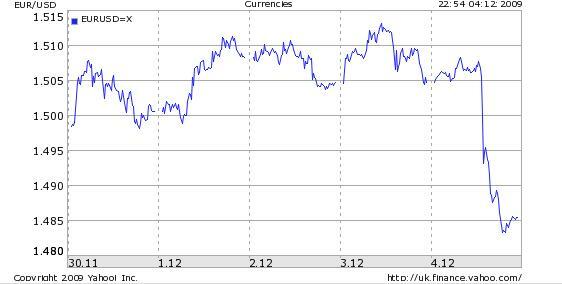 this affect the Dollar carry trade? and then stop for some time. 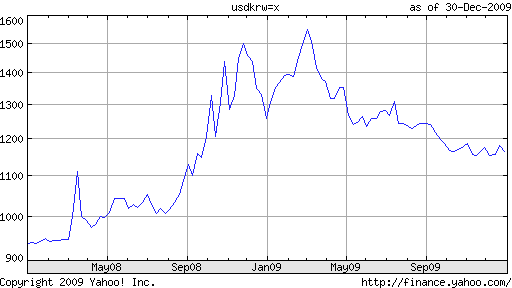 repetition of what we saw from 2002 to 2005.
currency) are necessarily brighter than for the Dollar? nominal GDP goes down, debt to GDP simply rises and rises. the future) will rise more slowly. situation promising. Basically some cases are much worse than others. markets certainly have not taken in this underlying reality. 1. Current EU economic policy seems to be favoring government spending and exports, at the expense of investment and domestic consumption. Does this imply that the current EU economic recovery is unsustainable? 2. It seems that the reason that the the the Fed’s liquidity injections have not resulted in price inflation is because much of the funds have been plowed back into capital markets, rather than used for consumption. Given that this liquidity must at some point be pumped out by the Fed, does this imply that a “correction” is inevitable? 3. Given the strong economic and fiscal fundamentals of Norway’s economy, do you think currency traders will begin to pay more attention to the Kroner? Do you think it could be taken up as a reserve currency by Central Banks that have become disenchanted with the Dollar? 3. It seems that the financial crisis has exposed some of the problems of a common economic/monetary/currency policy for the EU. What are the implications for the future of the ECB and the Euro? 4. So from what you are saying, there is still a risk of a resurgence in the financial crisis on Europe’s periphery. Would you say another round of financial turmoil is now inevitable? Well the risk is certainly there, and evidently Europe’s institutional structure is in for a very testing time. But no war is ever lost before the battles are fought, although what we can say is that new and imaginative initiatives are certainly going to be needed. Sovereign risk has now spread from non-Eurozone countries like Latvia and Hungary, straight into the heart of the monetary union in cases like Greece and Spain. Mistakes have been made. As I argued in my Let The East Into The Eurozone Now! blog post (http://globaleconomydoesmatter.blogspot.com/2009/02/let-east-into-eurozone-now.html) back in February 2009, the decision to let the Latvian authorities go ahead with their internal devaluation programme never made sense, and the three Baltic countries and Bulgaria should have been forced to devalue – and the accompanying writedowns swallowed whole – and then immediately admitted into the Eurozone as part of the emergency crisis measures. Perhaps some would feel that this lowering of the entry criteria would have damaged credibility, but as I am stressing here, leaving so many small loose cannon careering around on the lower decks can cause even more issues if matters get out of hand and contagion sets in. So it is a question of pragmatism, and being able to accept the “lesser evil”. Many analysts are pointing to Friday, December 4, as the day that logic returned to the forex markets. On that day, the scheduled release of US non-farm payrolls indicated a drop in the unemployment rate and shocked investors. This was noteworthy in and of itself (because it suggests that the recession is already fading), but also because of the way it was digested by investors; for the first time in perhaps over a year, positive news was accompanied by a rise in the Dollar. Perhaps the word explosion would be a more apt characterization, as the Dollar registered a 200 basis point increase against the Euro, and the best single session performance against the Yen since 1999. Previously, the markets had been dominated by the unwinding of risk-aversion, whereby investors flocked back into risky assets that they had owned prior to the inception of the credit crisis. During that period, then, all positive economic news emanating from the US was interpreted to indicate a stabilizing of the global economy, and ironically spurred a steady decline in the value of the Dollar. On December 4, however, investors abandoned this line of thinking, and used the positive news as a basis for buying the Dollar and selling risky currencies/assets. To be fair, it will probably be a while before the Fed hikes rates: “It’s a prerequisite to have a continuing decline in the unemployment rate for at least three months before the Fed considers tightening,” asserted one analyst. At the same time, investors must start thinking ahead, and can no longer afford to be so complacent about shorting the Dollar. As a result, emerging market currencies probably don’t have much more room to appreciate, since the advantage of holding them will become relatively less attractive as yield spreads narrow with comparable Dollar-denominated assets. To be more specific, investors will have to separate risky assets into those whose risk profiles justifies further speculation with those whose risk profiles do not. For example, currencies that offer higher yield but also higher risk will face depressed interest from investors, whereas high yield/low risk currencies will naturally greater demand. You’re probably thinking ‘Well Duh!’ but frankly, this was neither obvious nor evident in forex markets for the last year, as investors poured cash indiscriminately into high-yield currencies, regardless of their risk profiles. To be more specific still, currencies such as the Euro and Pound face a difficult road ahead of them (as does the US stock market, for that matter), mainly due to concerns over sovereign solvency. (Try saying that three times fast!) On the other hand, “Commodity-linked currencies such as the New Zealand, Australian and Canadian dollars [have] rallied sharply, and will probably continue to outperform as their economies strengthen and their respective Central Banks (further) hike interest rates. It remains to be seen whether investors will remain logical in 2010, since part of the recent rally in the US Dollar is certainly connected to year-end portfolio re-balancing and profit-taking, and not exclusively tied to a definitive change in perceived Dollar fundamentals. Especially since they remain skittish about the possibility of a double-dip recession, investors could very easily slip back into their old mindsets. For now, at least, it looks like reason is in the front seat, making my job much less complicated. While the Indian Rupee has risen more than 10%, since bottoming in March, it has increased only 4.3% in value in the year-to-date. Still, given how turbulent the first few months of 2009 were (a continuation of 2008, really), this modest appreciation was actually the third highest, among Asian currencies, behind only the Indonesian Rupiah and Korean Won. For those of you that don’t regularly follow the Rupee (to be fair, I probably fall into this category), it has basically ebbed and flowed over the last couple years in accordance with risk appetite, hardly breaking ranks with other emerging market currencies. It rose to record highs in 2007, only to lose 30% of its value in 2008 as the credit crisis exploded. In 2009, as I pointed out above, it has staged a modest recovery, as investors have hungrily poured money back into emerging markets. In fact, the benchmark Indian stock market index has risen 79% this year, its best performance since 1991. The bond market has also been performing well, thanks to a recent upgrade by Moody’s of the government’s sovereign local currency debt. “Moody’s said the move reflects ‘increasing evidence that the Indian economy has demonstrated its resilience to the global crisis and is expected to resume a high growth path with its underlying credit metrics relatively intact.’ ” As a result, foreign capital, some of which is bound to be speculative, is pouring into India. $100 million a day is being plowed into Indian stocks by foreign funds. Analysts remain extremely optimistic about near-term prospects of India, partly because of its association with China (termed “Chindia.”) “India’s exports climbed in November for the first time in 14 months after sliding an average 21 percent since October 200…Overseas shipments rose 18 percent to $13.3 billion from a year earlier.” The result is blazing GDP growth, clocked at 7.9% in the recent quarter. Interest rates are already a healthy 3.25%, and can be expected to rise in the near-term as the economic recovery continues to cement itself. Going forward, forex traders are relatively conservative in their forecasts for the Rupee, with consensus estimates for the currency to remain relatively flat during the course of the next year. This is surprising, given that it remains well off of its 2007 highs and thus, relatively cheap. Perhaps, its a sign that investors are nervous about the Indian government’s lack of a coherent long-term plan. Perhaps, it reflects uncertainty about bubbles that are forming in other corners of emerging markets. Probably, it shows that despite all of the progress that was made in 2009 towards containing the credit crisis, investors still remain vigilant, and are hedging their bets accordingly. As if forex traders didn’t have enough to worry about these days, now there is a new concern- that of sovereign debt default. The last couple months have witnessed a spate of minor episodes, all of which paint a picture of frightening cohesiveness about the state of sovereign finances, and the ability of countries to continue to finance and service their debt. As the economic recession moves into recovery (or at least, permanently distances itself from the prospect of depression), the markets will likely turn their gaze towards the long-term, with this issue looming large. It’s difficult to know where to begin, since people have been talking about the perennial budget deficits of the US for many years. As a result of the economic downturn (stimulus programs and falling tax revenues), these budget deficits have taken on truly awesome proportions. The 2009 deficit came in at a record $1.4 Trillion, and the deficit in the fiscal year-to-date 2010 is close to $300 Billion. The US, of course is far from alone, with virtually every nation (industrialized and developing, alike) operating in the red. Canada, Britain, Japan…even China – known for its fiscal prudence – are setting records with their budget shortfalls. As a result, “Moody’s…suggested that the countries’ triple-A ratings could face downgrades in coming years.” Greece’s sovereign debt was already downgraded, from AAA- to BBB+, while Spain has received a warning. Dubai is in technical default, but this is old news. It’s not as if any of this is surprising, or even new. Greece, for example, was running 10% budget deficits during the height of the credit bubble. With the bursting of the bubble, however, sovereign fiscal problems have both been both exposed and exacerbated. If ever there was a time when national governments could be expected to get their fiscal houses in order, this is not it. At this point, the markets appear to have resigned themselves to sky-high deficits for the immediate future, and have now begun to assess the implications rather than try to encourage governments to straighten out. Even though the US budget deficits and national debt are the highest in nominal terms, its Treasury bonds still remain the standard-bearer for global capital markets. Proving that point is that new Treasury issues are repeatedly oversubscribed, despite rock-bottom rates. “For every $1 of debt sold by the Treasury this year, investors put in bids for $2.59, up from $2.19 at this point in 2008.” Most importantly, the largest creditor – China – is headlining demand. Granted, the costs of insuring US debt (via credit default swaps) is rising, but investors generally remain cautiously optimistic about US finances. The story on the other side of the Atlantic is not nearly as upbeat. Investors responded to the downgrade of Greece’s credit rating, by pushing up the yield on its debt by 50 basis points, raising the spread to 2.5% over comparable German sovereign bonds. Ireland, meanwhile, is projecting a budget deficit of 13.2% this year, and Austria is receiving scrutiny for its banks’ risky lending practices in Eastern Europe. “The question for Europe now is how much more solvent are countries like Italy, Portugal and Spain…Could it be that these are the regions where the next financial shoe is going to drop?” Asked one analyst. The more important question is what would happen in the event of default, or even a spike in bond yields by a member of the EU. Technically, the treaty behind the European Monetary Union “contains a ‘no bail-out’ clause that prohibits one country from assuming the debts of another.” It seems hard to believe – from where I’m sitting at least – that other countries would sit by idly if one member began moving inexorably towards bankruptcy. Investors are certainly not blind to the notion of an implicit guarantee, which helps the weak at the expense of the whole. That could explain why Greek and Spanish bonds remain comparatively buoyant, while the Euro has suffered in recent sessions. Then, there is the UK. Of all of the world’s major economies, the UK is arguably in the most precarious financial position, especially relative to its size. As one commentator lamented, “Indeed, the cost of our [UK] government borrowing – as measured by the interest rate – is rising so quickly that within a month it could be higher than Italy’s.” He goes on to discuss how inflating away the debt would be pointless, given the sophistication of investors and the fact that government liabilities are indexed to inflation, and hence would offset any gains from debt devaluation. He concludes: “The solution to today’s fiscal crisis is the same as it has always been: to cut spending, reduce the deficit and learn to live within our means.” Based on modern history, that seems pretty unlikely. 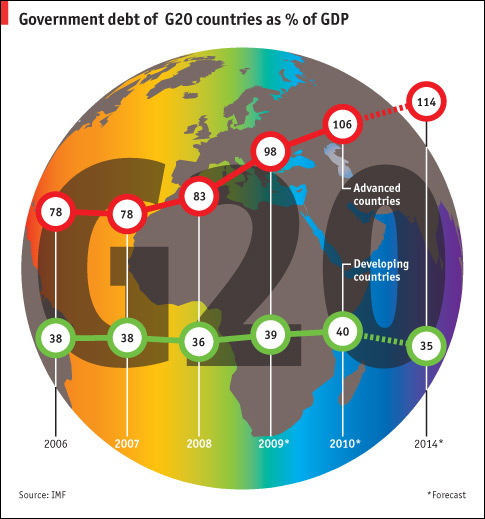 Could Britain, then, become the first industrialized country to default on its debt? Forex markets: take note. As I outlined in my last two posts, the Dollar could witness a rapid appreciation if/when the Fed finally raises interest rates. Given Chairman Bernanke’s frequent erring on the side of inflation, however, it could be months (at the earliest) before the Fed actually pulls the trigger. With forex markets guided by interest rate differentials, and traders’ uncertainty about the timing of interest rate hikes, its fair to say that the Dollar is at a crossroads. Currently, the case for an interest rate hike (as the Fed confirmed this week) remains weak: “They will need to see a lot more, better numbers consistently, not just for one or two months, before they would start to genuinely be talking more hawkish…I think the markets may be disappointed if they’re looking for hints of hikes coming soon,” said one strategist. While the data continues to improve – witness last week’s miracle jobs report – it has not yet been demonstrated convincingly and unequivocally that the economy has exited the recession. There are too many contingent possibilities that could send the economy into relapse for the Fed to even consider acting. As I said in my last post, I don’t personally expect a rate hike until next summer. Still, the markets are alert to the possibility. 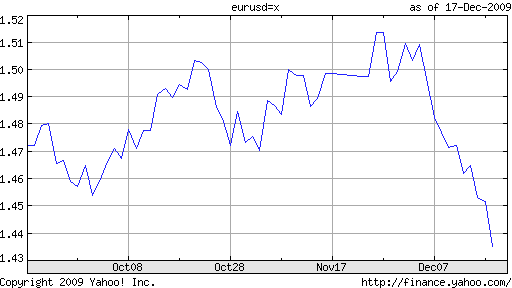 And where perception is reality, any sniff of rate hikes is enough to send the Dollar soaring; it has risen an impressive 5% against the Euro over the last couple weeks. That investors are acting so early to protect themselves against a possible rate hike shows the precariousness of the foundation on which the Dollar’s rise has been predicated. What I’m talking about here is the Dollar carry trade, in which investors borrowed in Dollars at record low rates, and invested the proceeds in riskier currencies and assets. It wasn’t so much the interest rate differentials they were chasing (only a few percentage points in most cases, hardly enough to compensate for the risk), but rather outsized returns from currency and asset price appreciation. In other words, while the S&P has risen by an impressive 50% from trough to peak (providing a handsome return to any investor smart enough to have foreseen it), stock markets outside of the the US have performed just as well. 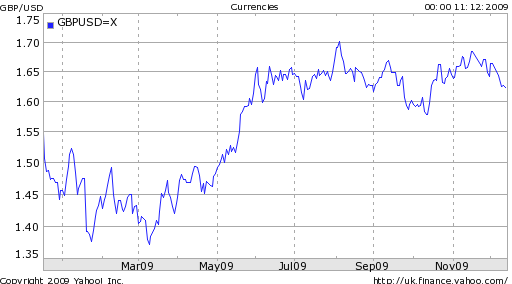 Factor in currency appreciation, and in some cases you are talking about gains of around 100%. In short, in forex, it’s never enough to be able to predict the economic future. Instead, you must be able to predict how these predictions will be syncretized into currency valuations by the markets. In this case, that means you need not necessarily be able to accurately predict when the Fed will hike rates; rather you need only be concerned with how other investors view that possibility, and whether that makes them feel more or less confident about holding certain currencies. The big story of the last month in forex markets has been the possibility that the Fed could soon hike interest rates, which would upend some of most stable (and gainful) strategies currently being employed by traders. As a result, the markets will certainly scrutinize the statement that accompanies today’s conclusion of the monthly rate-setting meeting, for any clues about the likelihood of such rate hikes. As I suggested in the title of this post, I think the best place to start in trying to forecast the near-term direction of US monetary policy is the man with the finger on the button – Ben Bernanke. Bernanke’s academic background offers valuable insight into his approach to monetary policy- an approach that has been fairly consistent so far and probably will remain that way, barring any unforeseen developments. Specifically, Bernanke is/was a scholar of the Great Depression. He has argued that the fault for prolonging the Depression (though not for Depression itself) lies with the Fed and the US government, whose responses to the crisis he lambasted as conservative. In short, policymakers continued to worry about inflation, when they should have been concerned about deflation, since it was a deflationary spiral – falling prices beget expectations of falling prices, repeated ad nauseum – that prevented the economy from recovering in a timely manner. Under Bernanke, the Fed’s response to the credit crisis was entirely consistent with this framework. It was the first industrialized Central Bank to cut interest rates, quickly reducing its benchmark Federal Funds Rate to 0%, a record low. The second stage involved literally printing more than $1 Trillion and injecting it directly into US credit markets. The Fed silenced its critics by insisting that the potential for inflation in the future doesn’t compare in seriousness to the possibility of deflation in the present. The markets have given Bernanke the benefit of the doubt in the short-term, but are pricing in a 50% chance of a rate hike before June 2010. Personally, I think it could be even later. Especially if housing prices experience a “double dip” and unemployment remains high, it seems unlikely that Bernanke would move to tighten. Regardless, he is known for his transparency, which means that when the Fed actually moves to hike rates, chances are investors will know about a month in advance. I’d like to follow up on my last post (Timing is Everything in Forex, Especially in this Environment) by looking at how to time one specific currency: the Pound. As I noted tongue-in-cheek with the title of this post, timing the Pound will not be difficult, since it is likely headed downward in both the short term and long term. In the short-term, the Pound will be crippled by the UK’s economic woes: “Britain is the last of the big G20 countries still to be mired in recession. Its GDP has shrunk by 4.75% this year, far more than the 3.5% reckoned likely in April.” There’s no reason to pore through the economic indicators, since all signs suggest that it won’t be until 2010 that Britain returns to positive growth. Of primary concern to forex markets, however, is not economic growth (or lack thereof, in this case), but rather how this will effect the decision-making of the Bank of England (BOE). To no surprise, the BOE announced yesterday that it would maintain its benchmark interest rate at .5%, and its liquidity program at current levels. It didn’t give any indication, meanwhile, that monetary policy on either of these fronts would change anytime soon. Thus, Britain could conceivably replace the Dollar as one of the preferred funding currencies for the carry trade. While the Fed is also in no hurry to hike rates, the US economy has already emerged from the recession, which means that regardless of when it tightens, it will almost certainly be before the Bank of England. Unless the BOE pulls an audible then, timing the Pound will be fairly straightforward; the currency should begin to slip as soon as its peers begin to raise rates. Some analysts expect that the Pound will decline to $1.50 per Dollar within the next six months. Over the long-term, the narrative governing the Pound is naturally more uncertain, but still straightforward. To try to dig itself out of recession, the government has spent itself well into the red, to the extent that this year’s budget deficit is forecast to be a whopping 12.6%, Next year could be even worse. The government has implemented a couple of half-baked measures designed to curb the deficit, but most of these are aimed at increasing tax revenue (which is futile during a recession), rather than trimming spending. While ratings on its sovereign debt were recently affirmed at AAA, Moody’s has warned that a downgrade in the next few years is not inconceivable. So there you have it. As far as I’m concerned, the only question of timing, vis-a-vis the British Pound, is when the decline will begin. My guess is sometime in the beginning of 2010, when investors start getting serious about projecting near-term interest rate differentials, and pricing them into exchange rates. While most forex traders aren’t thinking this far down the road, it’s also comforting (for bears, not bulls, obviously) that the long-term fundamentals point to a sustained decline in the Pound. Whereas the Dollar could jump up before heading back down – making timing a crucial skill – the Pound will probably just head down. I just finished reading a Wall Street Journal piece (Central Banks Rattle Markets), which laid out, in fairly broad terms, how the activities of Central Banks have become the main fodder for forex traders, and how this trend will continue as the global economy looks to move beyond the credit crisis. The piece got me thinking about the importance of timing, when it comes to forex. Let’s face it, timing is important when trading any security. Buying a stock one month earlier and/or selling one month later (as compared to the actual trade dates) could yield drastically different results. This is especially the case in forex, for a couple reasons. The first is that the majority of forex traders have a shorter-time horizon than investors in bread-and-butter securities. We’re talking weeks or months here, compared to years and decades. The second reason is that while long-term trends certainly exist in forex, the average return for all currencies (over a long enough time period) should converge to 0%, since forex is a zero-sum game. In other words, buy $1,000 worth of stock today, and you might be a millionaire by 2050. Buy a $1,000 worth of Euros today, however, and you will probably have about the same, give or take, 40 years later. We have entered a period of extreme uncertainty, specifically surrounding the actions of Central Banks. Without exception, all of these Central Banks eased monetary policy to aid their respective economies through the credit crisis. This easing varied widely from bank to bank, and ranged from interest rate cuts to “liquidity injections” to wholesale money printing. Just as the performance of many currencies has been guided by the degree of easing exacted by their respective monetary authorities, so will such currencies be guided by the degree and speed of tightening, going forward. For example, currencies such as the Australian Dollar and Norwegian Krone (as the WSJ article pointed out) have exploded since their respective Central Banks became the world’s first two to raise interest rates. Currencies such as the Dollar and Pound, meanwhile, remain in the doldrums, as it is forecast that the Fed and the Bank of England will be among the last to reverse the spigots of easy money that they unleashed last year. In short, the next year or two could prove to be extremely choppy (gainful for some, bitter for others) as currencies spike and dive in accordance with the Fisher Effect (the empirical idea that money moves from low-yielding currencies into higher-yielding currencies, as investors chase higher interest rates). For those that think the Dollar is doomed in the long-run, then, be careful about betting all of your marbles in the short-run. That’s not to say that the carry trade will disappear; on the contrary, it could accelerate if interest rate discrepancies widen before they shrink. Instead, consider yourself warned that if the Fed beats other Central Banks to the punch of raising rates, there could be a dramatic pause in the Dollar’s downward slide. The Canadian Dollar has been one of the world’s top performers this year, especially relative to the Dollar. The Bank of Canada is less than thrilled about this distinction, which is why it takes advantage of nearly every opportunity to remind the markets that it will do everything in its power to prevent the Loonie from rising further. The markets are beginning to wonder, however, whether the BOC is actually prepared to put its money where its mouth is, if push comes to shove. 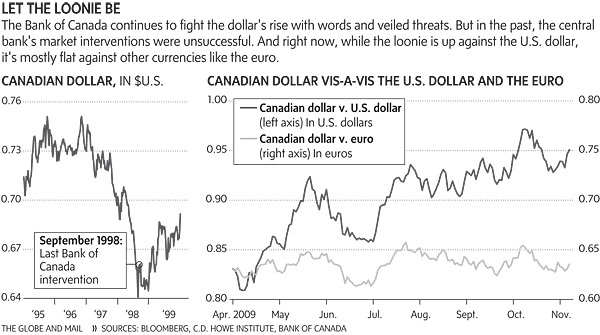 It’s impossible to say definitively whether the Canadian Dollar’s rise is justified by fundamentals. On the one hand, the ongoing economic recovery and commodities boom will specifically benefit resource-rich economies, such as Canada. It’s no surprise that Canada has been one of the most popular destinations for so-called “risk-averse” investment. Summarized one analyst, “It all revolves around the risk-aversion trade. Last week with equity markets and commodities selling off, we also saw the Canadian dollar selling off in that environment. Today the market settled down a little bit, so we were able to see the Canadian dollar claw back some of its losses.” In addition, it’s not as if the Loonie’s appreciation has been universal. Its gains are primarily against the US Dollar; in this sense, it has merely been subsumed into a larger trend, rather than having been singled out by forex traders. On the other hand, the economy is forecast to contract in 2010, before returning to full capacity at some point in 2011. The Bank of Canada has flooded the market with currency, via its own version of quantitative easing. Non-commodity exports are stalling, and the government is running record budget deficits. The benchmark interest rate is only .25%, and the BOC has committed to holding it there until June 2010, barring any unforeseen developments. Thus, there is no “positive carry” to be earned from parking money in Canada. In the context of forex intervention, this analysis is almost beside the point, since the BOC is clearly impervious to logic. Its decision to intervene at this point will probably be based less on economics and more on politics. You see, the Bank has left itself with very little wiggle room, should the Canadian Dollar continue to rise towards, or even past parity with the US Dollar. Its rhetoric has been fairly consistent; whether or not it actually has the wherewithal to intervene successfully (it probably doesn’t) it has conveyed to the markets that has both the means and the determination. As a result, the BOC has pushed itself into a no-win situation. 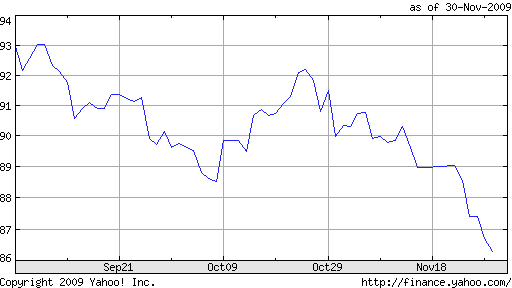 If the Loonie appreciates further and it doesn’t intervene, then it will have very little credibility going forward. If the Loonie rises and it does intervene, it risks incurring the wrath of the international community and wasting money towards a futile cause. “It’s hard for a modest-sized central bank such as Canada’s to flood the market with so much currency that it alters the balance of the world’s huge and complex foreign-exchange markets,” explained one economist. It’s basically a giant game of chicken between the markets and the BOC. Who will blink first? It’s been a while since I last wrote about the Euro (October 26: Euro Optimism (And not just Dollar Pessimism)). That’s because my perspective recently has been mainly Dollar-centric; I continue to believe that much of the recent movement in forex markets (with the exception of certain cross rates) can best be explained by the Dollar. Nowhere is this more evident than the Euro, whose rise should really be thought of in terms of the depreciation of the Dollar. It’s no surprise then that yesterday’s Euro decline – the steepest in months – was the result not of internal European developments, but rather of the US jobs report. 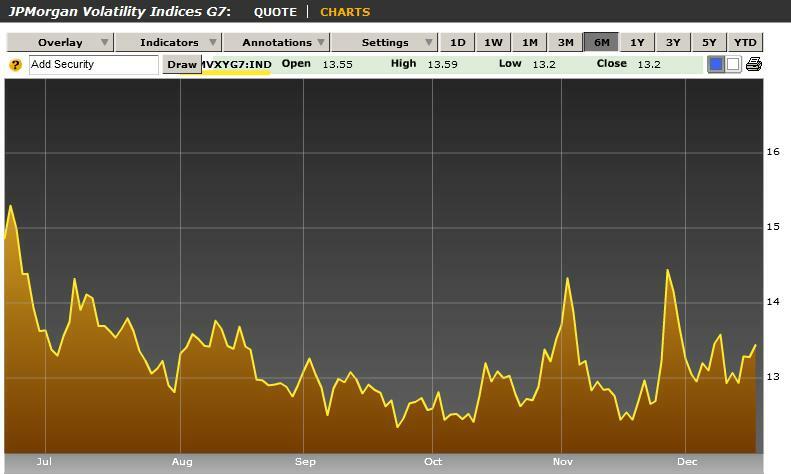 One analyst summarized the Euro’s ascent by noting, “The bias for risk-seeking is still in vogue.” This has nothing to do with the Euro, but rather is a roundabout way of speaking about the Dollar carry trade, which is responsible for an exodus of capital from the US, some of have which has no doubt found its way into Europe. In some ways, then, it’s almost pointless to scrutinize EU economic indicators too closely. That being said, there are a few meaningful observations that can be made. The first is that the EU economy is tentatively in recovery mode. Some of the most closely-watched indicators such as the German IFO index, capacity utilization, and Economic Sentiment Indicator, have all ticked up in the last month, while the unemployment rate is holding steady. For better or worse, this improvement can attributed entirely to export growth, due to the recovery in world trade. GDP rose by .4% in the most recent quarter, which means that the Euro Zone has officially exited the recession. The second observation is that many expect this exit to be short-lived. Due to the relative rigidity of the EU economy, specifically regarding the labor market, it may take additional time to get back on really solid footing. Thus, the European Commission “thinks that euro-area unemployment will continue to rise next year, reaching 10.9% in 2011. That will dampen consumer spending. Another worry is investment, which the commission thinks will fall by 17.9% this year. Businesses are unlikely to waste scarce cash on new equipment and offices when they have spare capacity. Firms confident enough to splash out may find it hard to secure the necessary financing from fragile and risk-averse banks.” The Commission also expects public finances to continue to deteriorate, perhaps bottoming at some point next year. There is even an outside concern that one of the fringe members of the EU could default on its debt, requiring a bailout in the same vein as the lifeline grudgingly being thrown to Dubai by the UAE. Finally, there is the European Central Bank. Much like the Fed – and every other Central Bank in the industrialized world, except for Australia – the ECB is nowhere near ready to hike rates. “The overall economic context doesn’t suggest that they would want to tighten anytime soon. There is a feeling that, yes, things have improved, but that nonetheless, the outlook is still quite fragile,” summarized one economist. 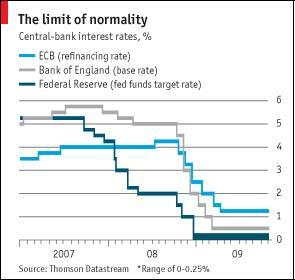 Sure, the ECB is winding down its liquidity programs, but so is the Fed. Based on long-term bond yields, investors believe that US rates could even eclipse EU rates at some point in the future. In short, there isn’t really much to be optimistic about, when it comes to the Euro. The nascent recovery is hardly remarkable, and probably not even sustainable. While the Euro might continue to perform the Euro in the short-term for technical reasons, I would expect this edge to evaporate in the medium-term. Last week, I opined on the official US forex policy (“Strong Dollar” Policy is a Joke). Most of my analysis was directed towards the lackluster efforts of US policymakers in failing to execute this policy, and I paid short shrift to the policy itself. With this post, then, I would like to address whether a Strong Dollar is, on balance, actually good for the US economy, specifically as it bears on the balance of trade. Dean Baker, of the American Prospect, in a post germane to this discussion, wrote that “Folks who took econ 101 know that currency fluctuations are the mechanism through which trade imbalances adjust.” Unfortunately, as anyone who follows the forex markets no doubt understands, reality is much more complicated. As the WSJ reported, US exports skyrocketed during the last decade when the Dollar was falling. Case closed, right? However, exports also rose during the 1990’s, when the Dollar was in fact rising. This contradiction should make make anyone think twice before assuming a cut-and-dried relationship between the Dollar and exports think twice. While exchange rates certainly correlate with export volume, there are a few confounding variables. Fist is the lag time between fluctuations in exchange rates and corresponding changes in exports. That’s because the majority of international trade is conducted by large companies and because global supply chains are not completely fluid. In other words, if the Dollar collapses tomorrow, it will take years before companies can fully modify their sourcing arrangements accordingly. In addition, it is mainly on non-durable goods that companies have relative flexibility on choosing sourcing locations. In this age of ODM and OEM, it’s not difficult for Nike to shift production to Vietnam if the Chinese Yuan is suddenly revalued. On the other hand, it is significantly more complicated to move an automobile manufacturing plant or oil refinery. Investments in production facilities for durable goods are made on a long-term basis, then, and aren’t responsive to short-term changes in exchange rates. If you look at the breakdown of US exports, it is heavily concentrated in services and high-tech products, many of which it’s not (yet) practical to outsource. For goods and services that are low-skilled labor-intensive, it’s obviously cost-effective to produce them overseas, because wages are lower. This is not a product of exchange rates, but rather to disparities in standards of living and levels of development. In China (where I am based), factory wages rarely exceed 8RMB per Dollar (about $1.25 at current exchange rates). Conservatively, that’s probably less than 1/20th of US counterpart wages, when you look at salary and benefits. That’s why the weak Dollar hasn’t done much to dent US demand for imports. Personally, I don’t expect to see the RMB rise 1500% in the next few years to erase this discrepancy, which means that’s unrealistic to ever expect the US Dollar to depreciate enough to ever make the US competitive enough in certain export categories. Obviously, the inverse is true for imports. From the perspective of the US, the shifting of non-durable goods production outside the US represents a permanent structural changes in the US economy. Regardless of how low the Dollar sinks, it’s not reasonable to assume that the US will once again become the hotbed of low-tech manufacturing activity that it once was. Overall, exports have actually risen steadily over the last decade (and the last 50 years, on average); the problem is that imports have risen even faster. In fact, ebbs and flows in the trade deficit can be better explained by global economic cycle than by short-term fluctuations in exchange rates. Despite the weak Dollar, the US trade deficit has exploded over the last decade because of a comparable explosion in US consumption, which was made possible by cheap credit. 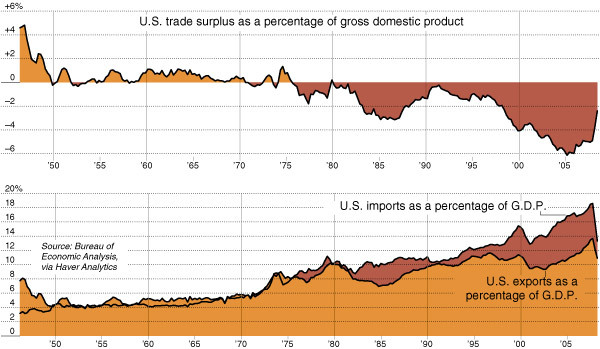 When that cycle came to an abrupt end in 2008, the trade deficit narrowed dramatically, despite the rise in the Dollar that took place simultaneously. Given that the US has basically committed itself to importing certain goods, a Strong Dollar is actually beneficial, because it reduces the cost of those imports. In the short-run, then, a 20% decline in the Dollar might be expected to correlate with a 20% rise in the trade deficit. The hope is that this can be offset over the long-term, with the relocation of production facilities (yes, foreign companies also outsource to the US; it’s a not a one-way exodus) to the US and the creation of new products/services that can fill the void of those that have already been outsourced. 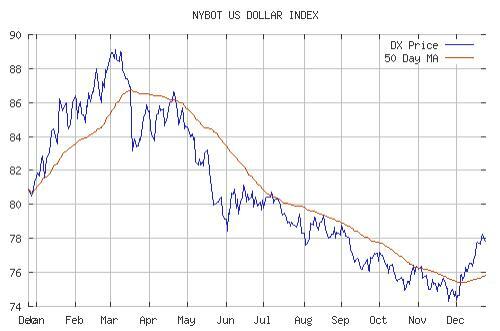 In short, it’s not clear that a weak Dollar will dramatically improve the US trade imbalance. This can best be accomplished not through a weak exchange rate, but through incentives that stimulate innovation and discourage consumption of low-quality, non-durable goods, the majority of which are produced overseas. When you consider the inflation (Strong Dollar keeps prices in check) and financing (Strong Dollar increases the willingness of foreigners to invest in and lend to US entities) perks, the Strong Dollar probably provides a net benefit to the US economy. If Bernanke and Geithner actually believe this, it would be nice if they conducted policy accordingly. Given this nearly uninterrupted record of waffling, one might think to accuse Mr. Fujii of deliberately trying to confuse the markets. After all, how else can one explain the hourly changes in his forex policy. It’s ironic that Fujii himself has told reporters that, “It’s wrong to fuss over the currency market’s daily movement,” considering that his feelings on intervention seem to fluctuate in accordance with the Yen. Thankfully, we may not have to deal with this carnival of uncertainty for much longer, as the Bank recently told reporters that “The government, not the BOJ, decides whether to intervene in currency markets.” At the same time, intervention would ultimately be carried out only under the auspices of the BOJ, which would presumably have the authority to determine a targeted valuation. As for the million-Dollar question of whether intervention is more likely now that the Japanese Yen is closing in on a post-war record, it’s a bit more nebulous than it was in October. It seems that the political will now exists to intervene. The main obstacles are Fujii, himself, who had earlier pledged to administer a free-market approach to managing the Yen, and the international community. Given that Japan still runs a trade surplus, it would be difficult to justify forex intervention. In addition, the Democratic Party of Japan (DPJ) made election promises to wean the Japanese economy off of its dependency on exports to drive growth and instead to cultivate a domestic consumer base. This promise was apparently reiterated to US President Obama during his visit to Japan earlier this month, and would be greatly embarassing if Japanese economic officials reneged so soon thereafter. At the same time, politicians (of any nationality) are not exactly known for their integrity and their consistency, so it wouldn’t be surprising if they decided that in the context of the Yen’s continued strength that they decided to take action. “The sense of caution over the possibility of intervention is definitely higher now after the breach of Y85.00. We are all watching for any more comments from the authorities.” Given the political implications, however, it seems the more likely course of action would involve a tweaking of monetary policy – quantitative easing, under the guise of deflation fighting – rather than outright intervention. Such would be less awkward than intervention, and probably more successful.